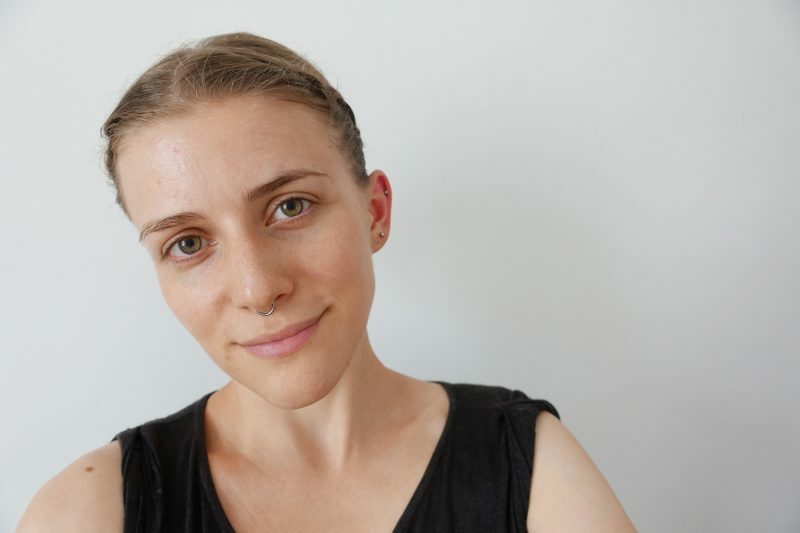 A Guide To Vegan Food in Georgetown! 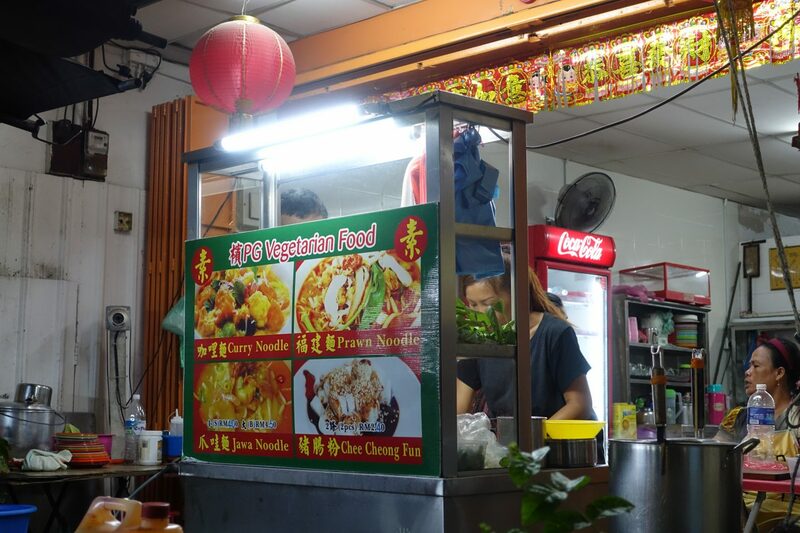 There is such an abundance of vegan food in Penang, Georgetown. As always, this list will primarily feature places that are affordable, by local standards. This is something that’s really important to me. Oftentimes I read through reviews, claiming that a place is affordable and usually a quick look at the menu reveals that it isn’t, not by local standards anyway. I love supporting places that offer delicious, vegan food at affordable prices, for everyone. I love this place so much, I made a separate post about it. 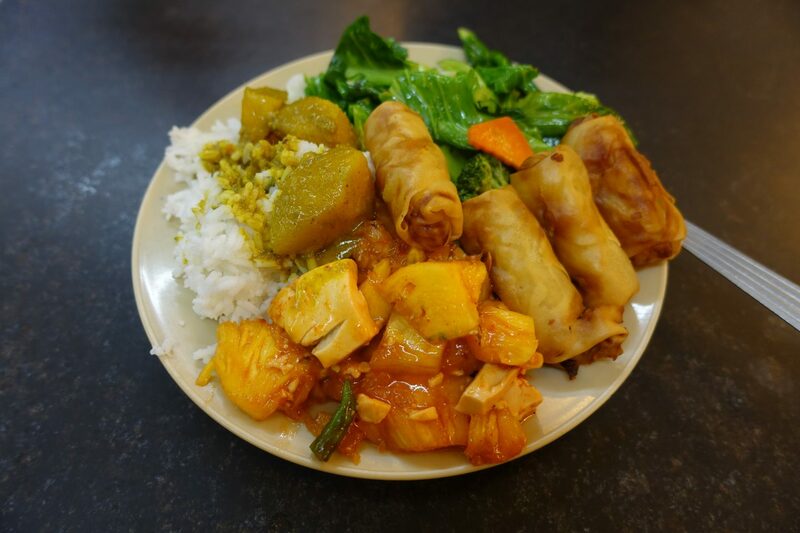 Chang Yuan Vegetarian Food is a small, family-run and super low-key vegetarian eatery. They have a huge buffet and this is how it works: You simply take a plate, load it up with food, and head to the register to pay. Prior to loading up my plate, I asked how much I can expect to pay. I got told that, depending on what you picked and how much, you are going to pay RM 5 – 7 per plate. I ended up paying RM 5 for the plate below and really loved the food! Jaya is a super low-key Indian restaurant. Since leaving India I’ve been craving Indian food and so I ended up going there on several occasions. 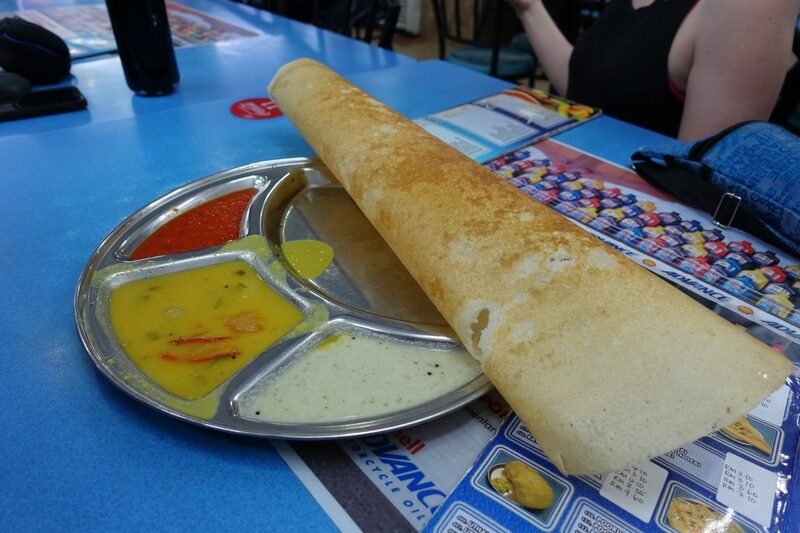 While the food, especially the curry, isn’t mind-blowing, I greatly enjoyed their paper dosa. 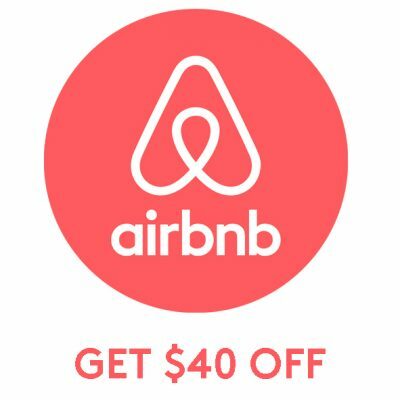 Check out their TripAdvisor reviews here. 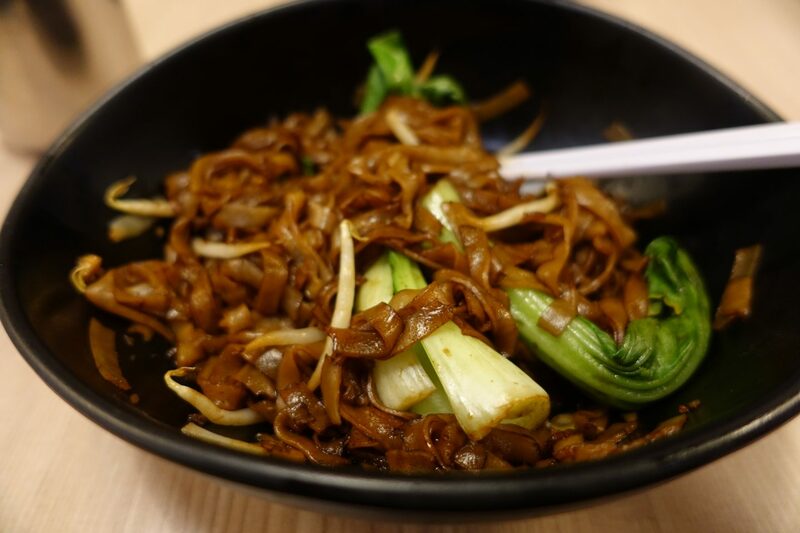 Luk Yea Yan is a small vegetarian restaurant serving economic rice and local dishes. I enquired about the price of their economic rice (buffet) and got quoted RM 15-20. At Chang Yuan Vegetarian Food it’s only RM 4-6 and Luk Yea Yan’s buffet is, therefore, way too expensive. That being said, I highly recommend their Laska (it’s amazing!) for RM 6.50 and if you are into mock meat, try their satay for RM 8.50. 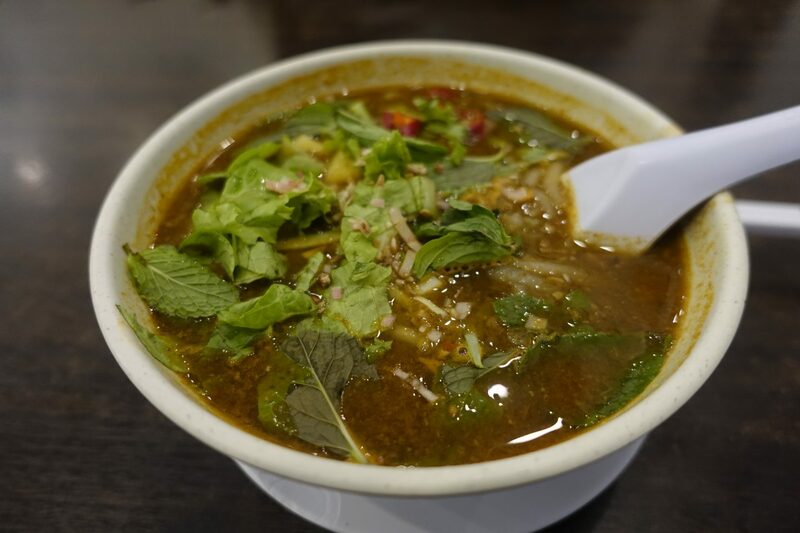 Whole Grains Soup Noodle is a small cart within my favorite restaurant, Chang Yuan Vegetarian Food. 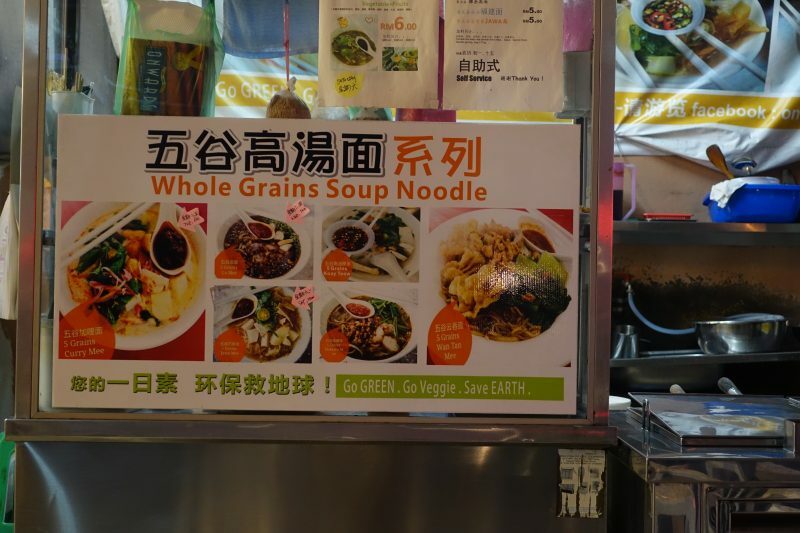 I got told that Whole Grains Soup Noodle is only open around 7-9 AM however, I saw them being open around lunch on several occasions. They have a small photo on their cart showing what will be served each day. When I visited on a Saturday morning Jawa Mee was on the menu, and it’s seriously one of the best soups I ever had. 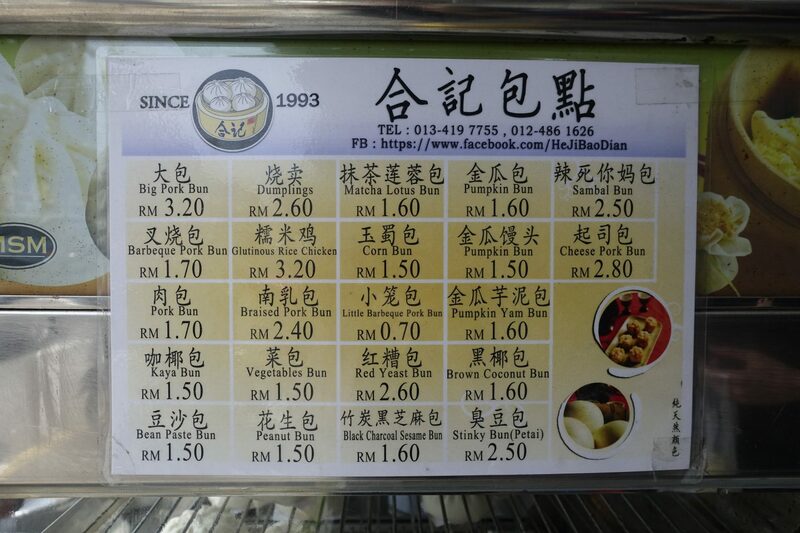 I paid RM 4 and most soups appear to be RM 4-6. 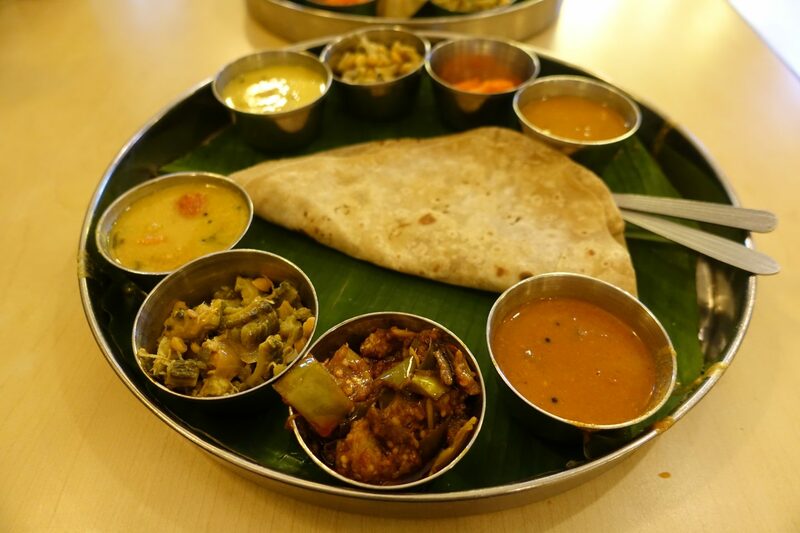 Woodlands is a vegetarian Indian restaurant serving a huge variety of dishes. They have a large menu with lunch specials and certain dishes that are only made in the evening. The staff members made sure that my order didn’t contain ghee/butter and I felt very comfortable placing my order. I ended up ordering a chapati set for RM 8, and while I didn’t like some of the vegetables, I would overall recommend it. 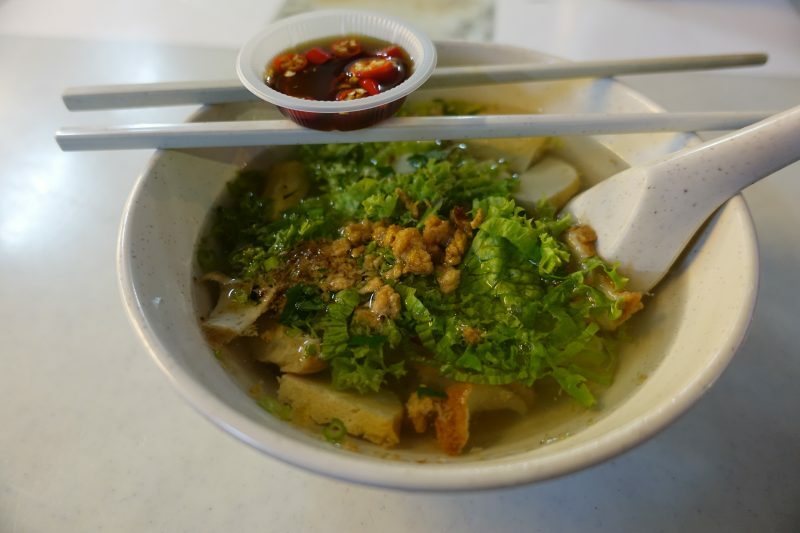 Char Mee Hoon Seng is a small vegetarian restaurant located on the buzzing Jalan Kimberly. Although the selection is small, the dishes that they do offer are amazing. On the menu is curry noodle, prawn nooodle, jawa noodle, and che cheong fun. 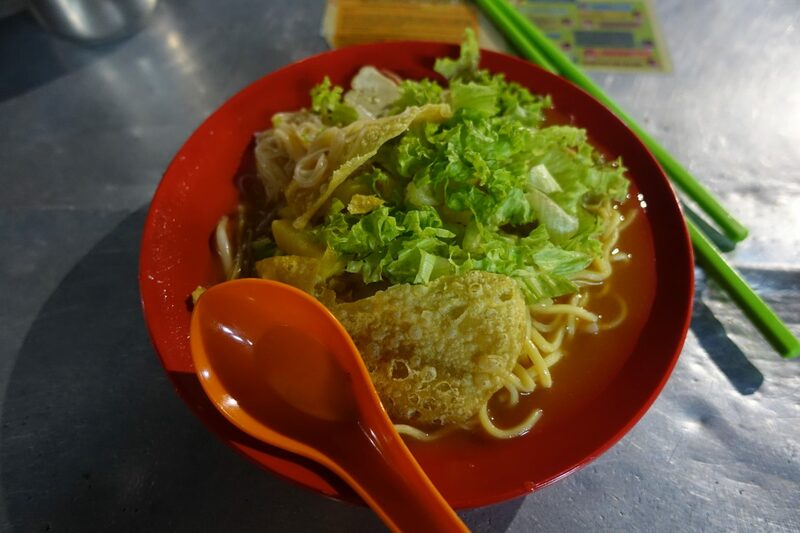 I ordered jawa noodle (RM 4) and my partner got the curry noodle (RM 4) – both were incredible! Fresh desire is located inside the Gurney Plaza. It’s a small ice cream store that offers coconut milk based ice creams. They have local flavors such as red bean, jackfruit, durian and the like. 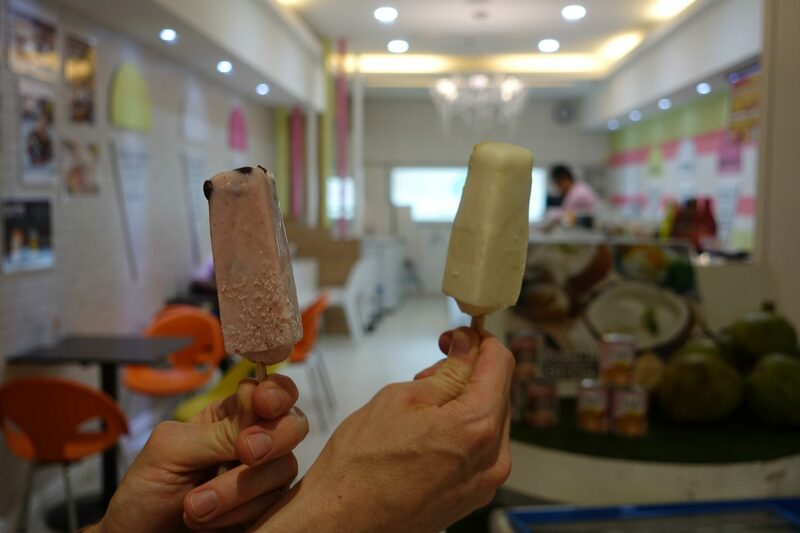 They have ready-made popsicles from kochabi.com and fresh homemade ice cream. I opted for a red bean popsicle and my partner got durian. Both were only RM 2 each. 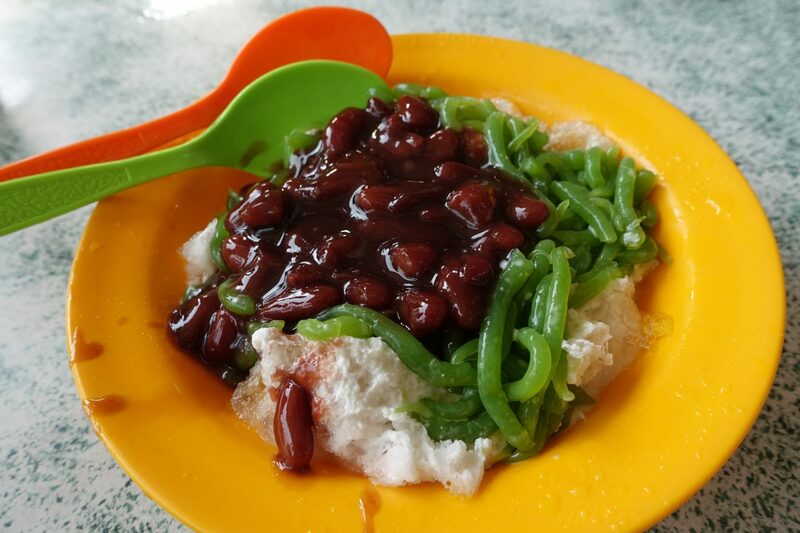 Swato Lane Ice Kacang offers two of Malaysia’s most famous desserts: Ice kacang and cendol for RM 4 each. 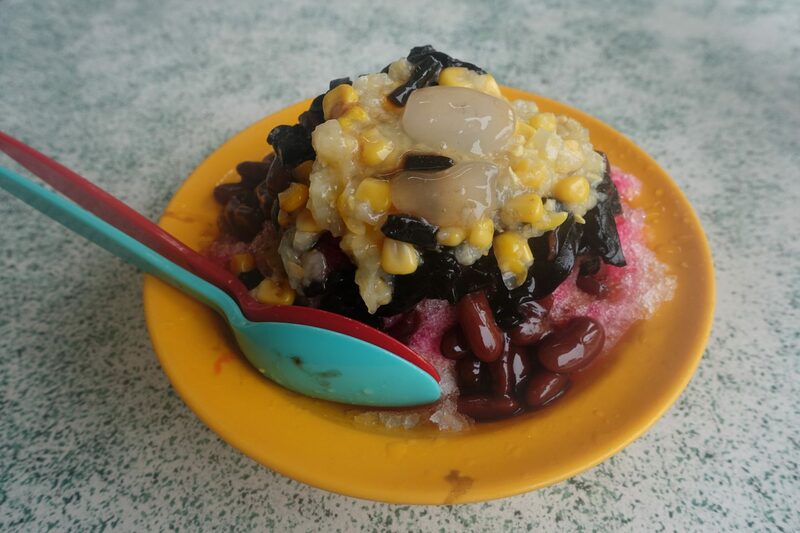 Ice kacang is a Malaysian dessert made out of shaved ice, red beans, grass jelly, sweet corn, syrup and condensed milk. Make sure to ask for it without condensed milk and you are good! Cendol is made out of freshly shaved ice, coconut milk, chewy green rice flour jelly (cendul), red beans and coconut sugar. I loved both of them and highly recommend you to check them out! 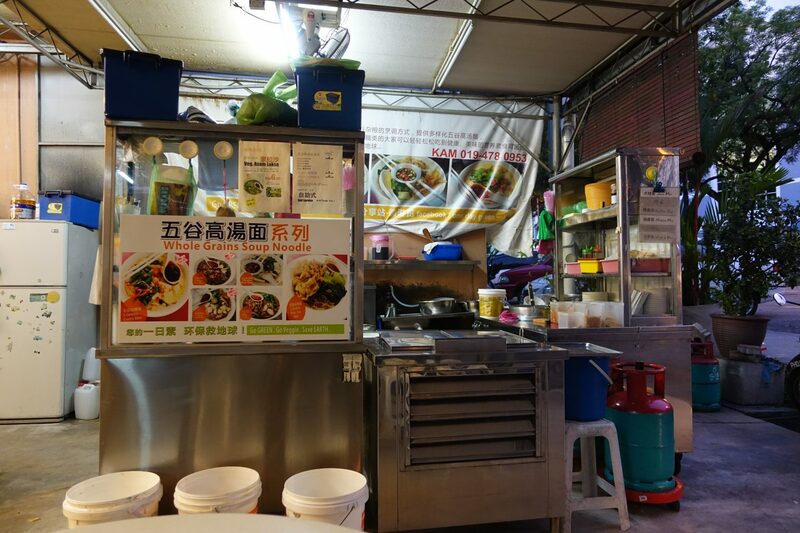 This street food stall is so popular, they are on google maps. Just type in “Penang Road Famous Teochew Cendul“ and it should take you straight to their location. 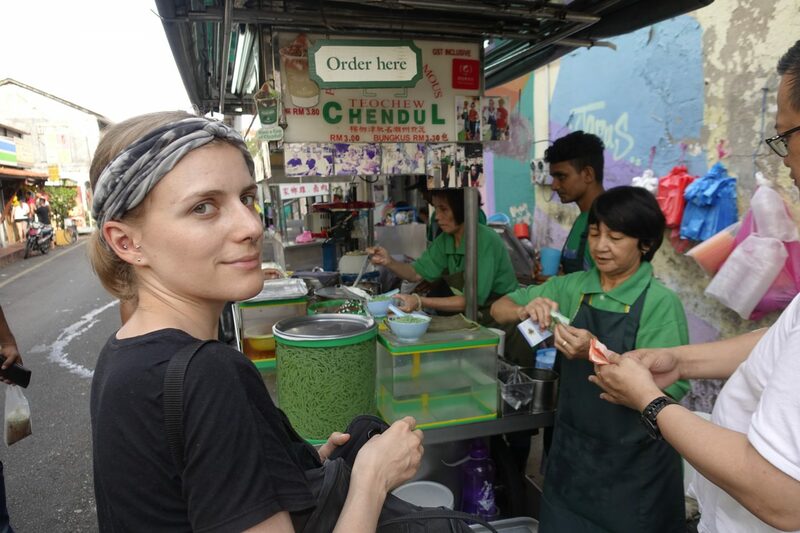 This street food vendor is making some of the best Cendol in town! As mentioned, Cendol is a popular Malaysian dessert that is usually 100% vegan and absolutely delicious. This stall sells Cendol for RM 3 and I highly recommend it. 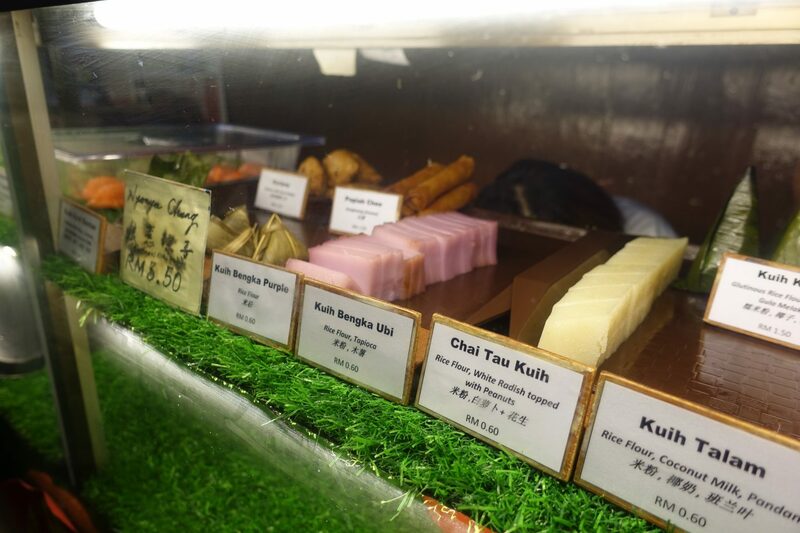 Kuih Nyonya Moh Teng Pheow is a family run place that’s famous for its Nyonya Kuih. Right when you enter you are surrounded by traditional equipment for making Nyonya Kuih. If you are lucky you may even visit while they are in the process of making a new batch. All the way in the back is a little cafe selling various kinds of kuih. Each is around RM 0.60-1.50. There is a minimum order of RM 3. I tried different ones and loved them all. Have a look at this post for more information about this wonderful place. 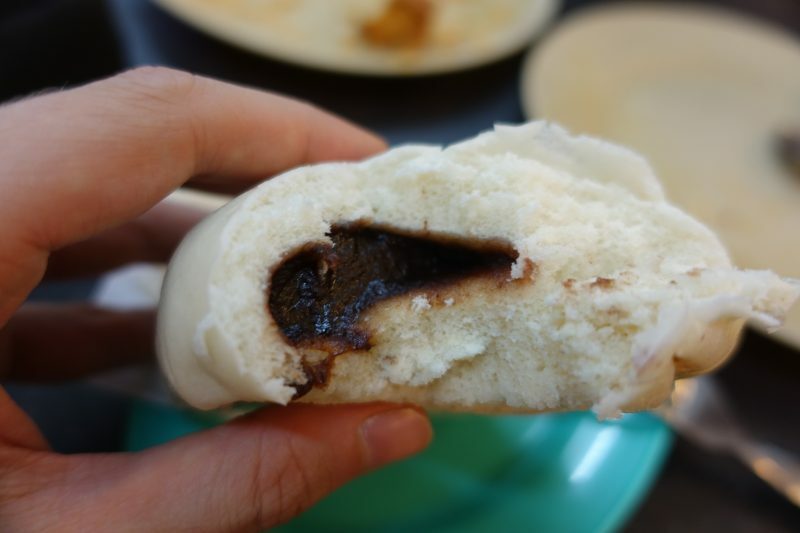 I loved it so much, I made a separate post about Nyonya Kuih. 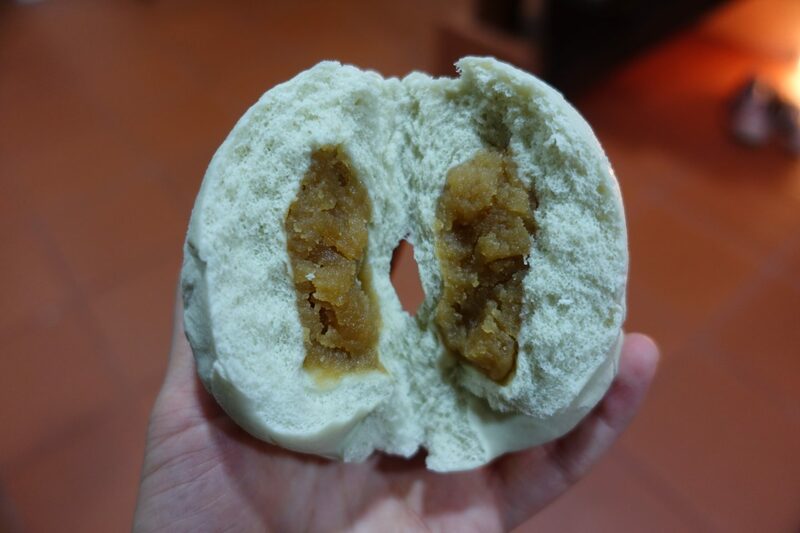 He Ji Bao is famous for their steamed buns (bao). They have a great variety of flavors and are using natural food coloring only. 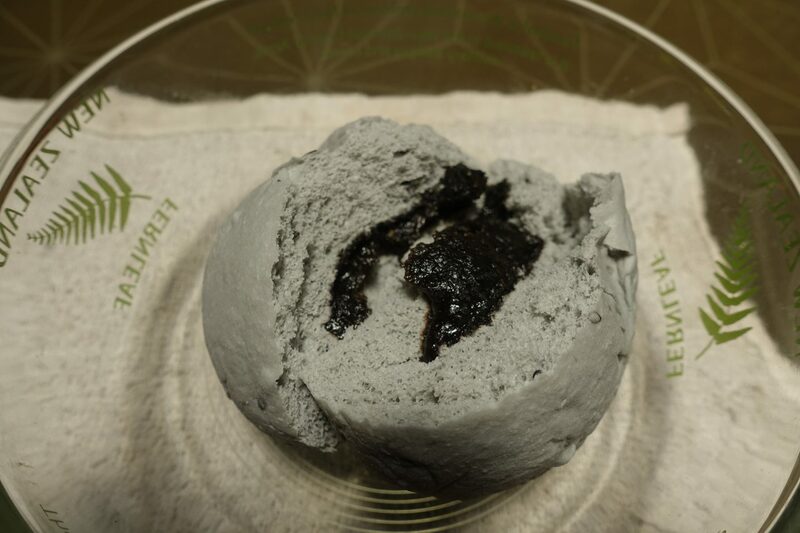 I tried the classic Red Bean Bao (RM 1.50), Charcoal Black Sesame Bao (RM 1.60) and the Matcha Lotus bun (RM 1.60). Not all buns are vegan, so make sure to double check when in doubt. I highly recommend you to check this place out, if you have any questions, shoot them a question on Facebook. This little cart posts up every evening on the intersection at Lebu Campbell and Lebuh Cintra, in China Town. 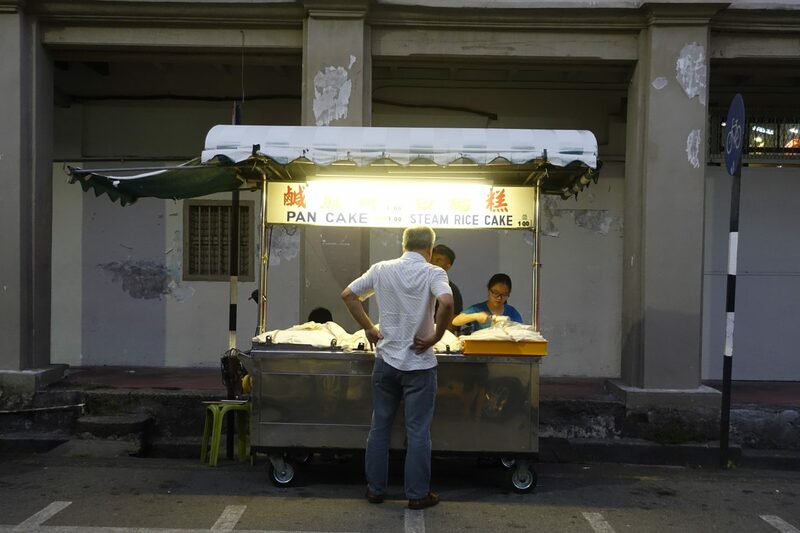 The cart sells pancakes with red bean and steamed rice cake. 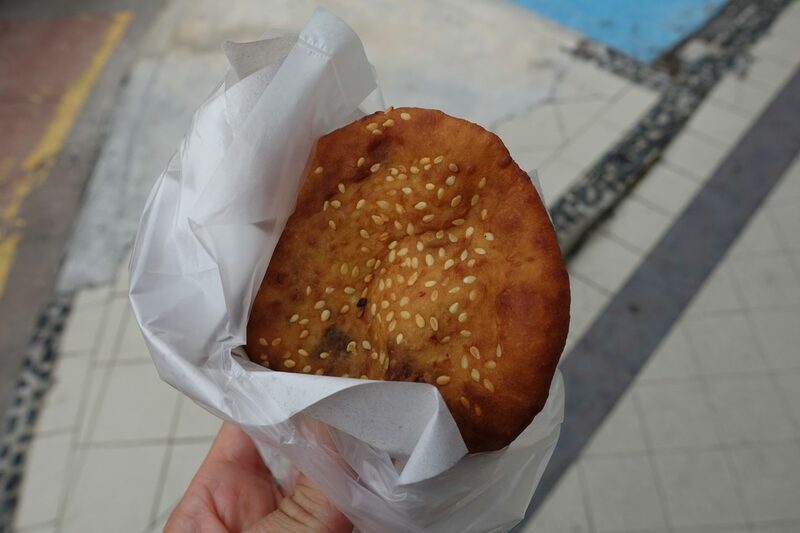 I ended up having the pancakes with red bean on several occasions and loved them. 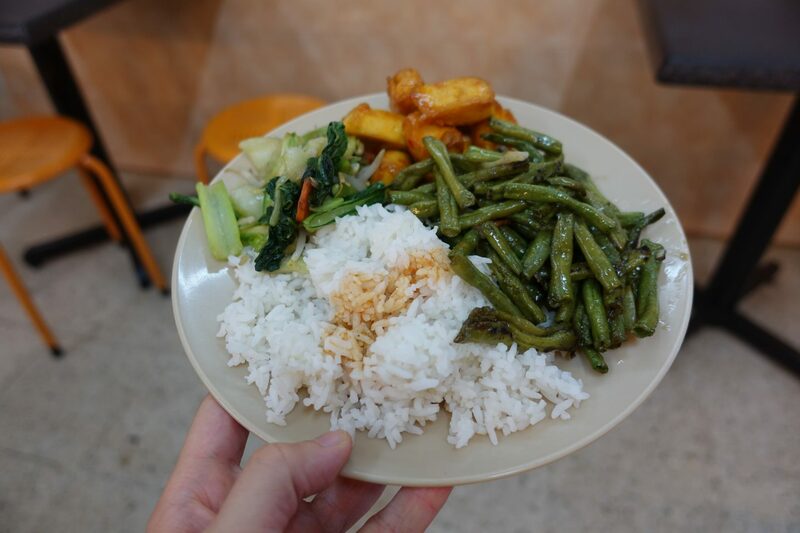 This was it for my guide to vegan food in Penang. 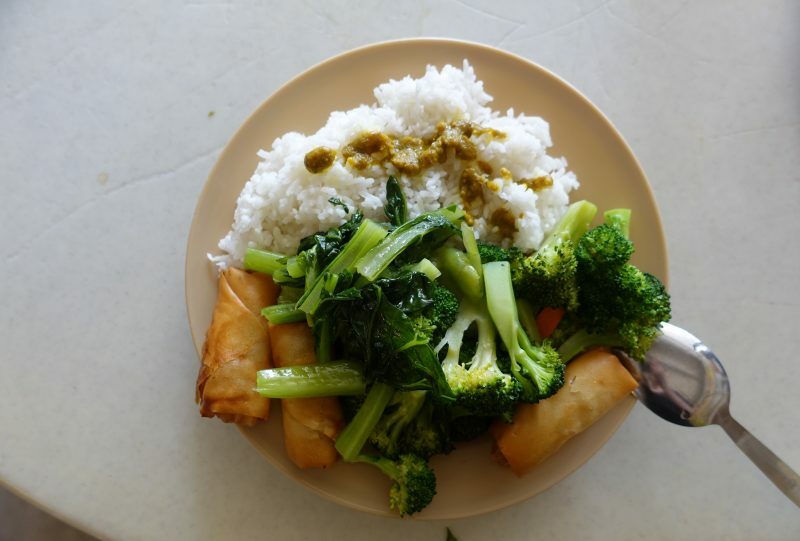 If you need any tips, make sure to reach out to the Penang Vegetarians Facebook group, it’s a very active group! Let me know if you have any favorite places in George Town!